Hyliacloud Isn't Hylia a character from Zelda or something? I love all songs by Poets of the Fall, but their music videos are creepy. I can't listen to "Carnival of Rust" without thinking of worn-down funfairs and decaying clowns anymore. This is PotF's official channel. ...Have fun. ..Then there's all sorts of video game bgm, like "Damnation" from 2nd Super Robot Wars OG. Tickets to Nicosia and Torshavn available. Note the blue line - I take dummies. Just let me know about it by PM~ EDIT: Updated the list of available breeds. I've added Candelabra, Aria/Bright Pink and Frilled. Sycamoreflight ...Given the other Canopies, this seems like a Pokémon reference? Flux Capacitor Ooo, time travel. My Name is Jeff F LMW ...Because all I can think of is "Wake Up Jeff" and now IT'S PLAYING IN MY HEAD. "Dorothy the Dinosaur's munching on some roses~"
"The power to change the direction of the gears of fate... that is the Force of Passion!" i.e. "180 Degrees ~Force of Passion~", the duet of Oscar and Arios (Kenyuu Horiuchi and Ken Narita) from Angelique. 8D I own the entire Angelique Vocal Complete Box which means 152 songs worth of music! <3 //////// "Vienne ~Wien no Mori no Monogatari~", the duet of Shinobu Ousaki and Yusuke Fudou (Katsuyuki Konishi and Makoto Yasumura) from Kiniro no Corda. It's so pretty I just HAD to translate part of the song into English~ <3 "Ousaki: The wind blows in gently, following the green hills Yusuke: The sunlight is shining down, arching through the trees Ousaki: The calm Yusuke: Scenery too Ousaki: Your visit Yusuke: Seems to make it happy Ousaki: With always more Yusuke: Of a shine Both: If you strain your ears within this forest You can hear the beat going back and forth The feelings that go along hand in hand Become one in this eternal place"
Fire Emblem Fates: Special Edition - got mobbed by ninja, spearmen and guys with axes. All at the same time. I hate thee, Conquest Chapter 15. I'd much rather fight Faceless than do that Chapter again. I sometimes have problems with Creedence Clearwater Revival and John Fogerty. BAD MOON RISING Heard: "I've seen birth, quakes and lightnin'" Actual: "I've seen earthquakes and lightnin'." Heard: "Let's find and take your dad" Actual: "Well it's bound to take your life" Heard: "I hear the voice of racial ruin" Actual: "I hear the voice of rage and ruin"
Do manga volumes count as books? If so, I've got Super Robot Wars OG: Divine Wars ~Record of ATX~, Pokémon Adventures, Are You Alice?, At Laz Meridian, Ginga Densetsu Weed, Magi, One Piece, Haikyuu and several "Alice in the Country of n/a" going at the same time. I also got the English volumes of B'tX recently so I'll be starting that one. Whenever I feel like it (and have time), I pick up an actual book - currently I've been obsessed with history and bought "The Edge of the World" by Michael Pye two days ago. It's about the evolution of sailing in Northern Europe, and how maritime exploration and trade shaped that area of the world (I'm from Finland myself so it's kind of exciting~). I've also got "Warfare in the Ancient World" and Enrico Ascalone's "Mesopotamia" waiting for me to continue reading them... I've loved Mesopotamian history and ancient warfare since I was a little girl. The Belgariad/Malloreon, Elenium/Tamuli, Althalus and Dreamers series by David Eddings. Though I'm pretty certain that will never happen. Dave was VERY clear that he will never allow anyone to film his books - he said that he was trying to teach kids to read while pulling them AWAY from TV screens, and filming his books would defeat that purpose altogether. And I love Dave for that~ ...Also Janny Wurts's The Wars of Light and Shadow. It's got some complicated English sometimes, but that would only make the series / movies more amazing. ...How exactly do you fight the sky, anyway? 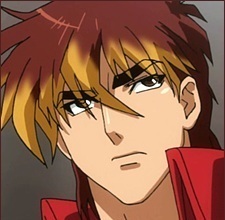 <--- Anyone who doesn't know who this guy is: Kyosuke Nanbu, mecha pilot extraordinaire. No matter how tough your armor, he has but to kick it. And his voice is strong enough to break a mic with a single scream (Toshiyuki Morikawa is infamous for this - he broke a recording mic while screaming "VOLTEKKA" at it, and later broke ANOTHER one with the same scream).